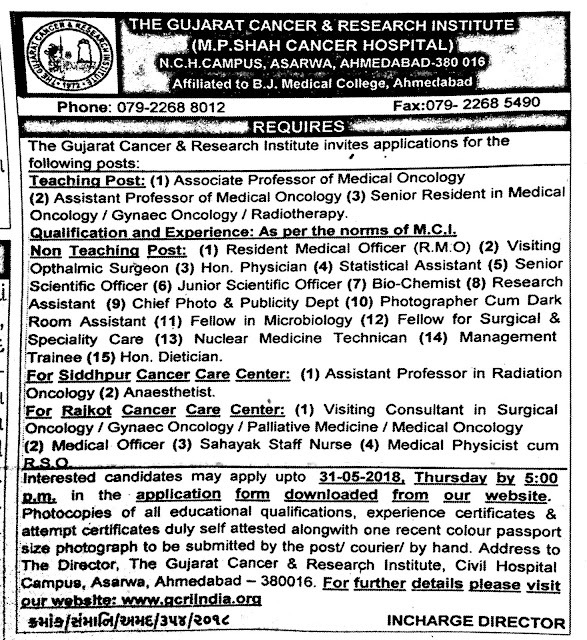 Gujarat Cancer & Research Institute (GCRI) has published Advertisement for below mentioned Posts 2018. Other details like age limit, educational qualification, selection process, application fee and how to apply are given below. How to Apply: Interested and Eligible Candidates applying through E-mail must send hard-copies of all other documents related to educational and experience certificate etc. before last date of submission of application. Application received without documents will be out-rightly rejected. Photocopies of all educational qualifications, experience certificates & attempt certificates duly self attested along with one recent color passport size photograph to be submitted by the post/ courier/ in person to given below address.